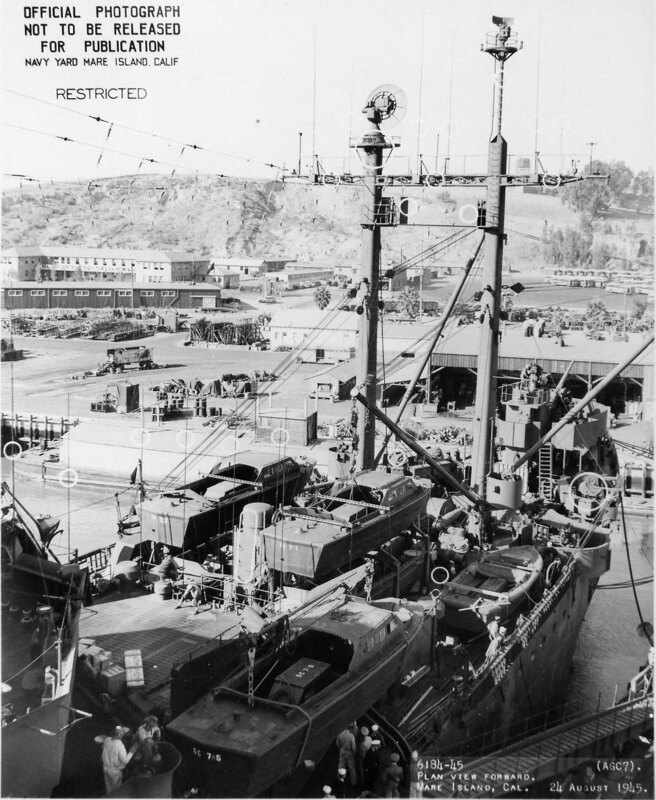 Laid down, 31 July 1943, as Cyclone, a Maritime Commission type (C2-S-AJ1) hull, under Maritime Commission contract (MC hull 1347) at North Carolina Shipbuilding Co. Wilmington, N.C. 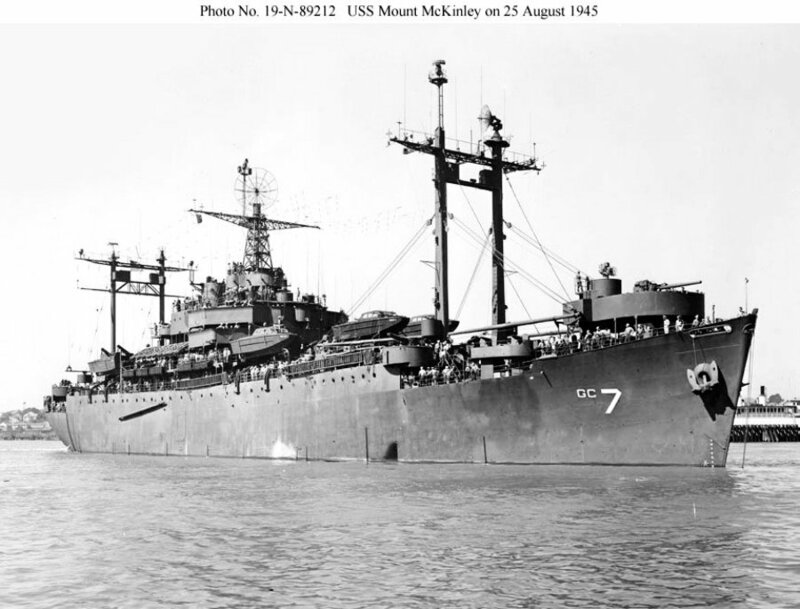 Commissioned, USS Mount McKinley (AGC-7), 1 May 1944, CAPT. 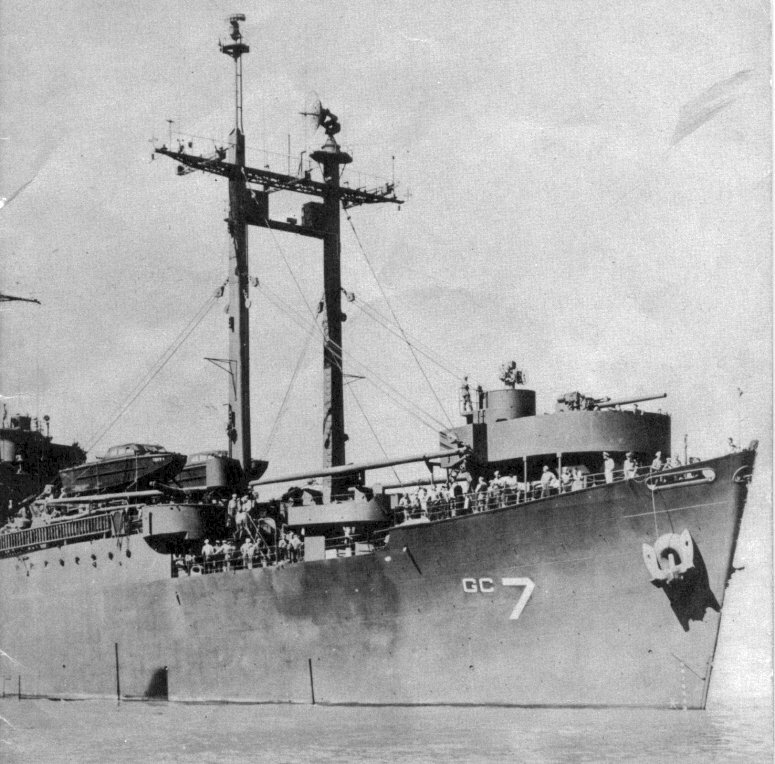 Roy W. M. Graham in command. 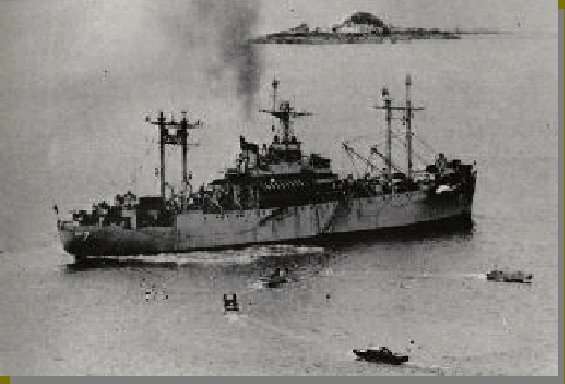 19k USS Mount McKinley (AGC-7) underway, date and location unknown. 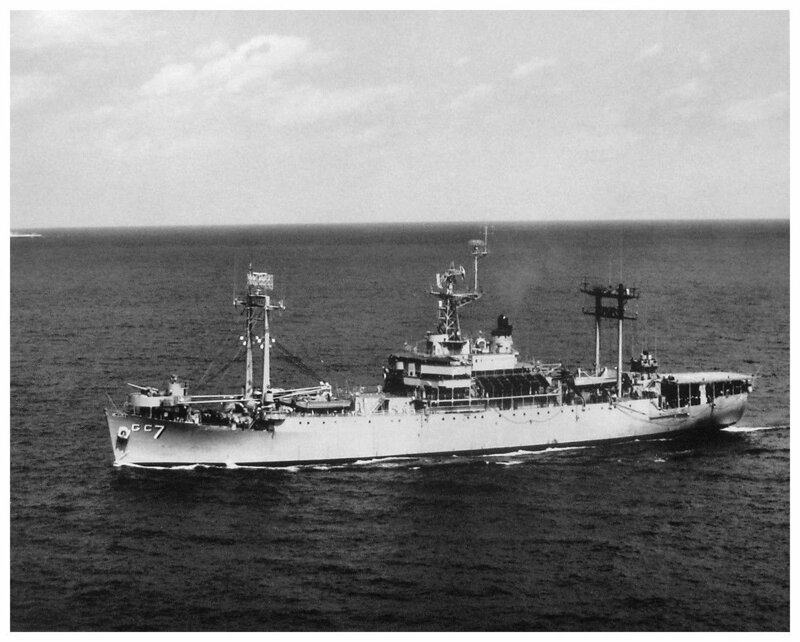 99k USS Mount McKinley (AGC-7) underway, date and location unknown. 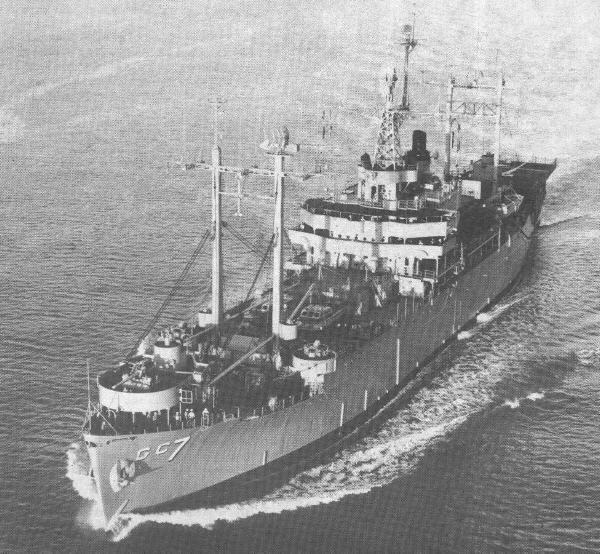 128k USS Mount McKinley (AGC-7) underway, date and location unknown. 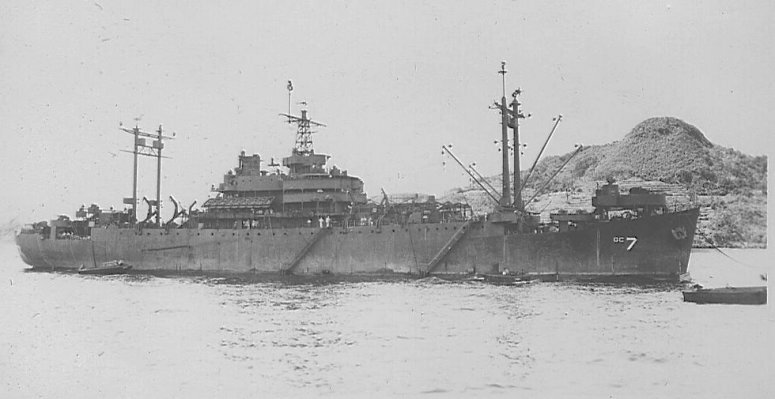 48k USS Mount McKinley (AGC-7) moored to a buoy at Sasebo, Japan, circa 1945. 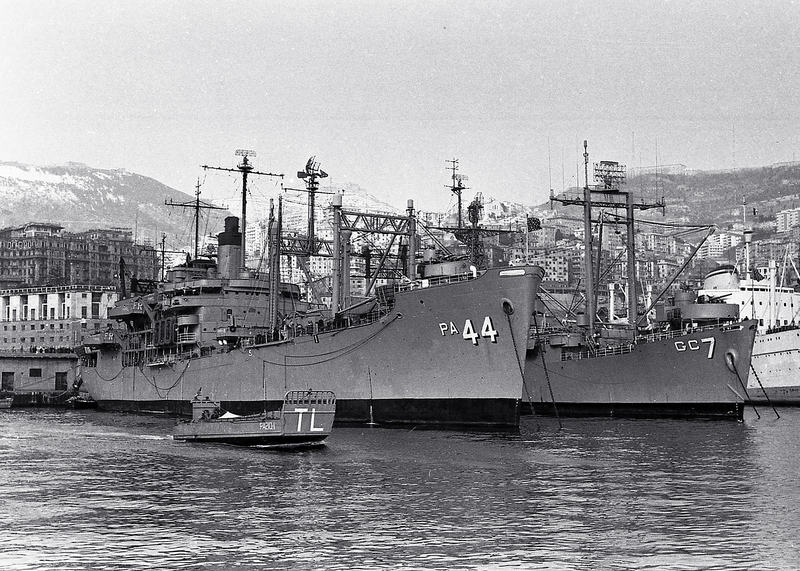 495k USS Mount McKinley (AGC-7) moored to the pier opposite USS Vincennes (CL-64) at Navy Yard Mare Island, 7 August 1945, circa 7 July to 29 August 1945. 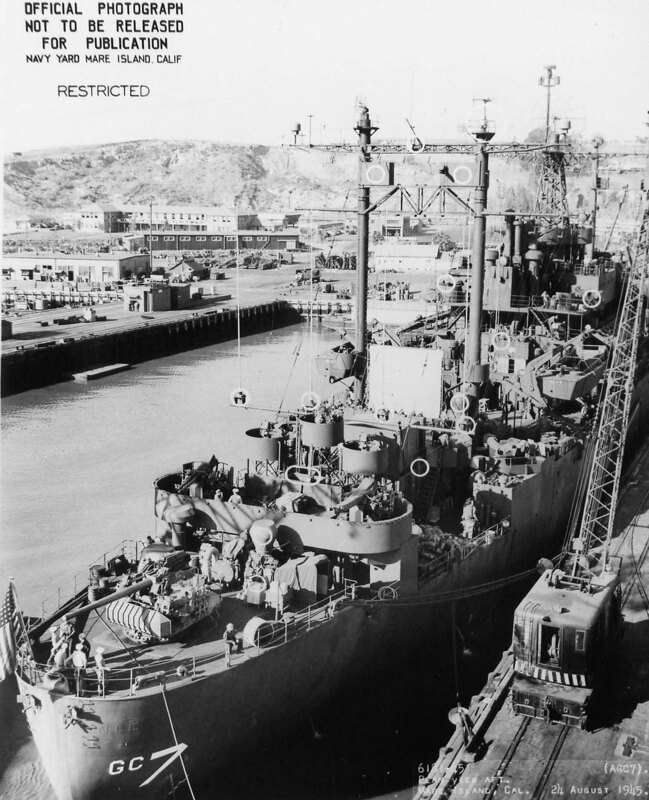 Stern view of USS Mount McKinley (AGC 7) at Mare Island Navy Yard, 24 August 1945. 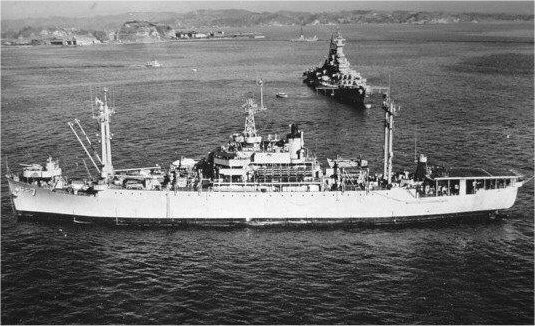 206k Amidships view of USS Mount McKinley (AGC-7) at Mare Island Navy Yard, 24 August 1945. 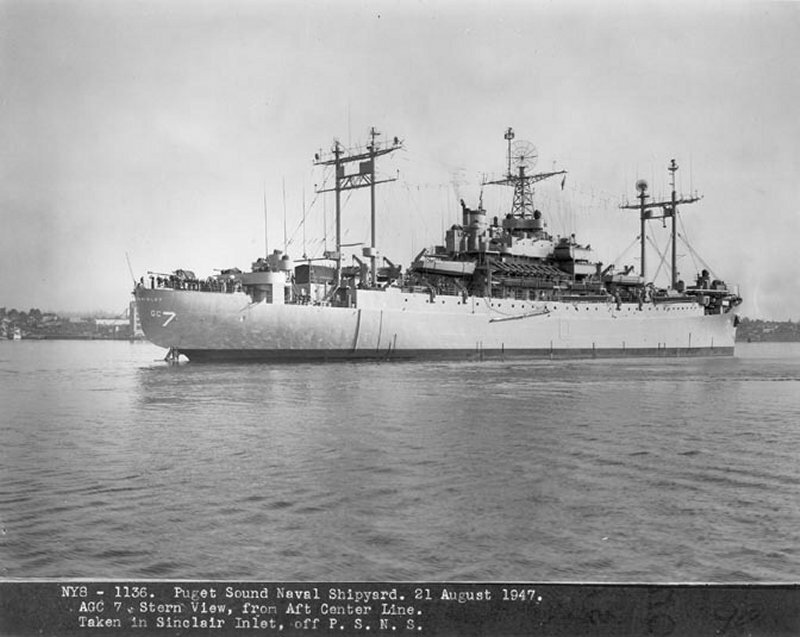 The big dish on her lattice mainmast is a long-range SK-2 air search radar; the smaller dish forward is an SP for height finding and fighter control. 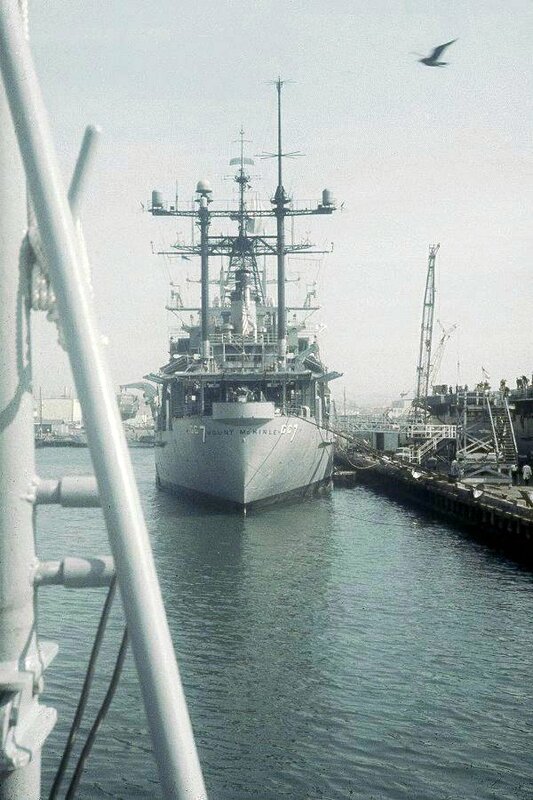 Note the HF whip antenna newly installed abaft her deckhouse. 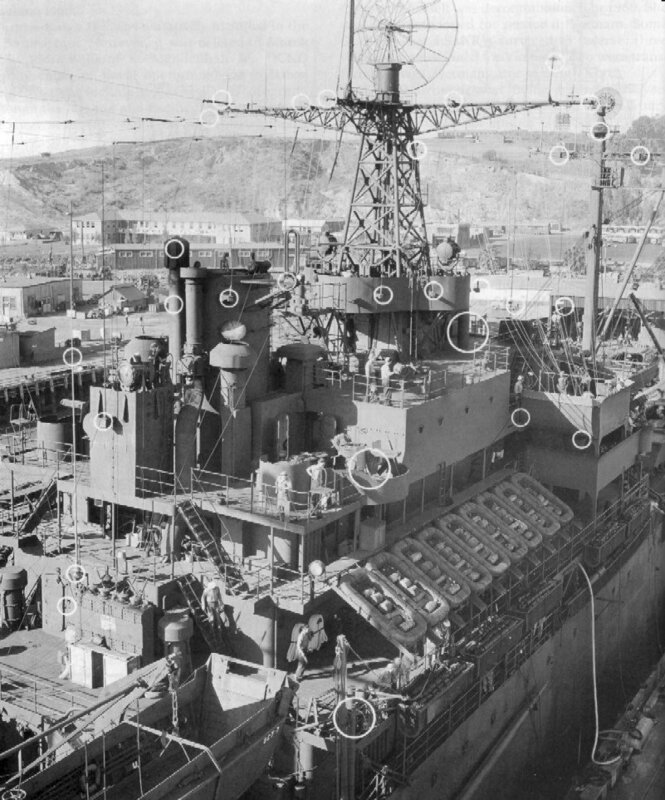 In the second photo note atop the bridge is a navigational range finder. 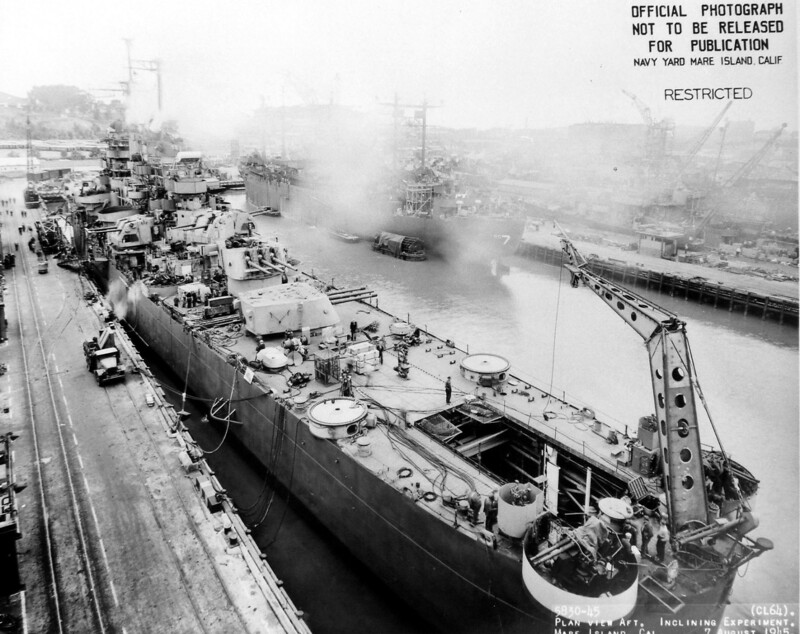 107k USS Mount McKinley (AGC-7) emerging from a Mare Island refit, 25 August 1945. 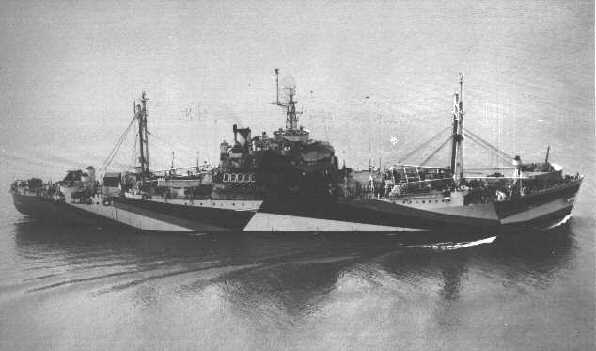 The two small radomes on the crossyard of her after goalposts are radar direction finders, which were used both as sensors and to support jamming. 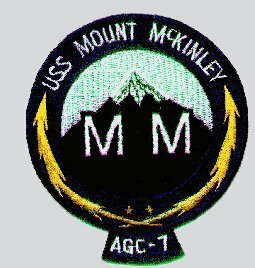 83k USS Mount McKinley (AGC-7) underway, date and location unknown. 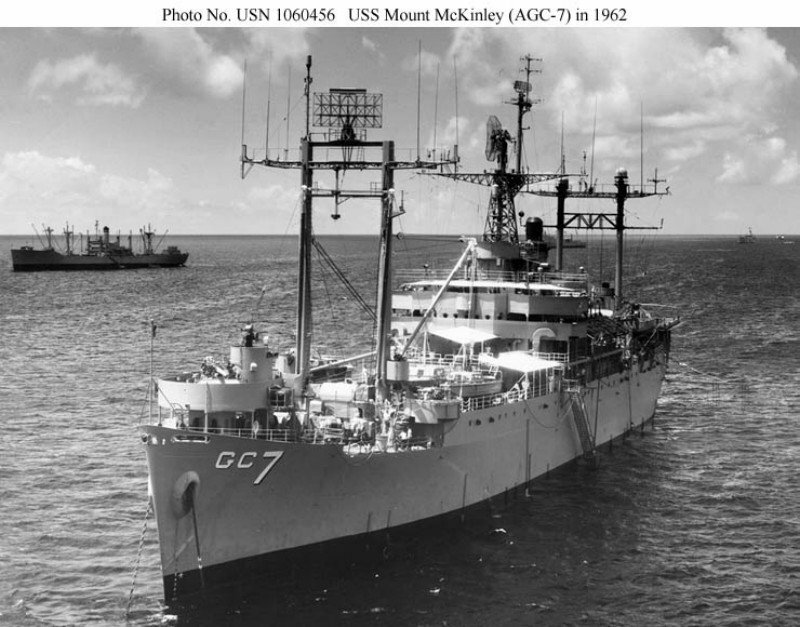 67k USS Mount McKinley (AGC-7) underway, date and location unknown. 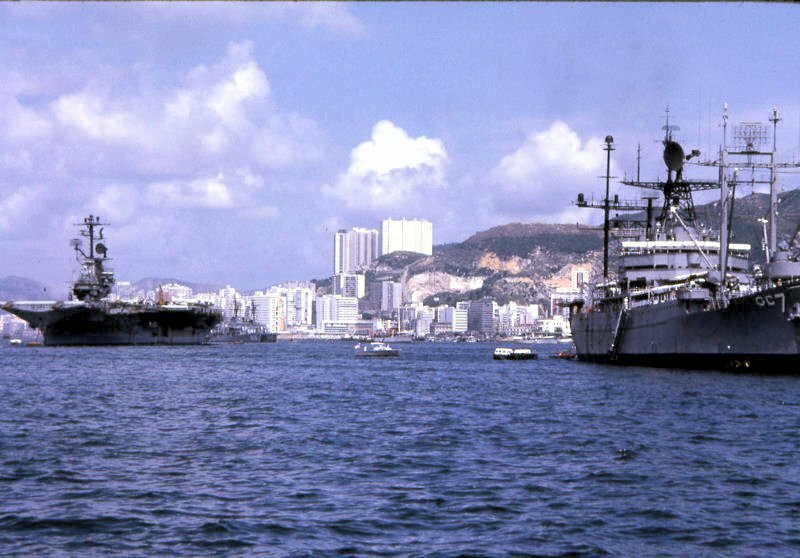 41k USS Mount McKinley (AGC-7) at anchor, date and location unknown. 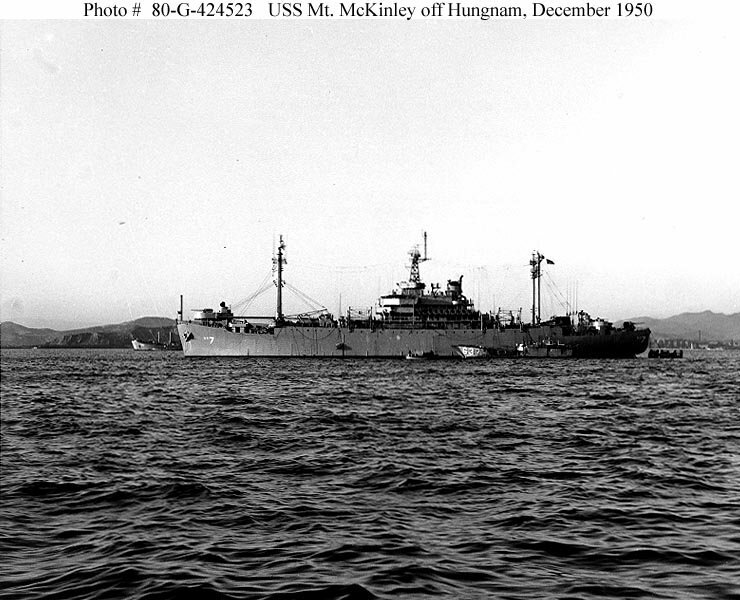 105k USS Mount McKinley (AGC-7) anchored off Hungnam on 19 December 1950. 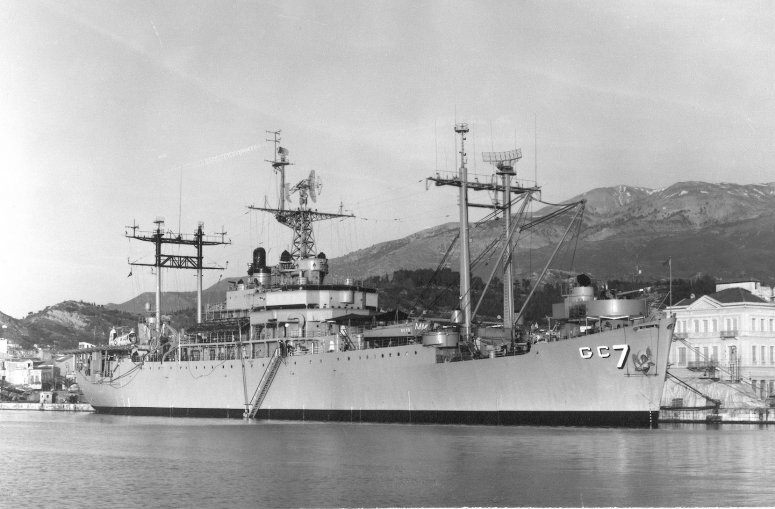 LSU-637 is alongside Mount McKinley. 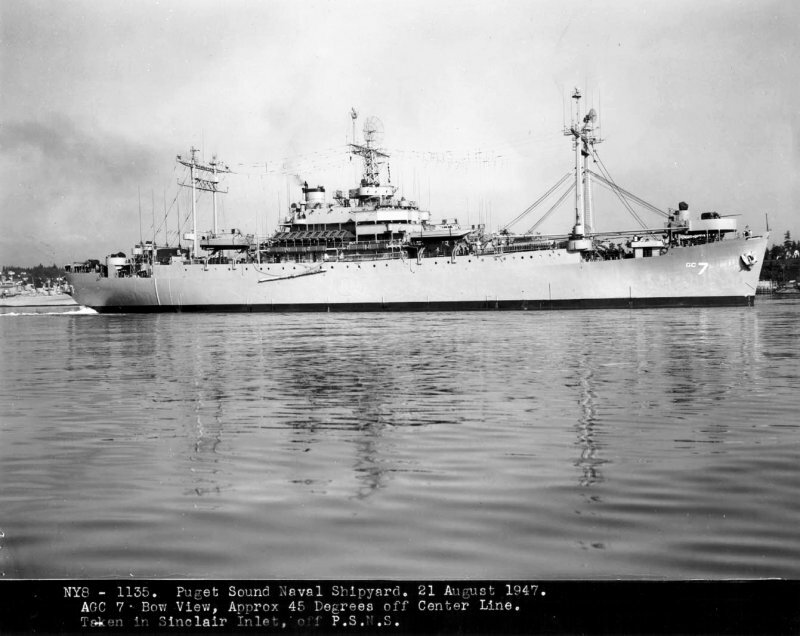 USS Askari (ARL-30) is partially visible beyond Mount McKinley's bow. 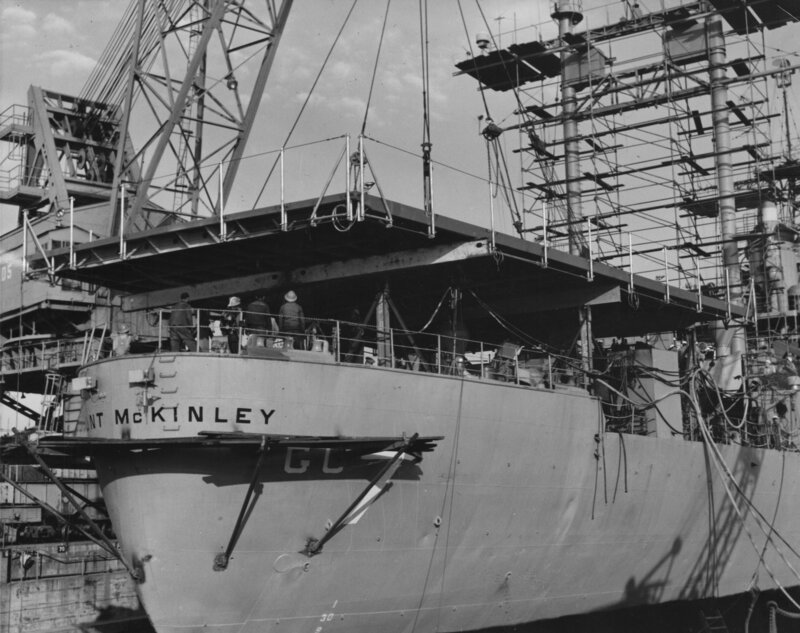 302k USS Mount McKinley (AGC-7) helicopter deck being installed at Mare Island Naval Shipyard, Vallejo, CA., in June 1953. 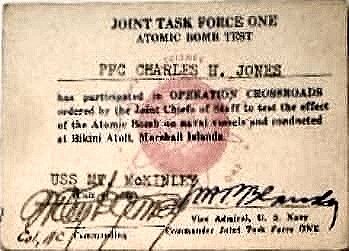 183k USS Mount McKinley (AGC-7) off Pearl Harbor in wash-down preparing for the nuclear detonation off Eniwetok Atoll in the Pacific. 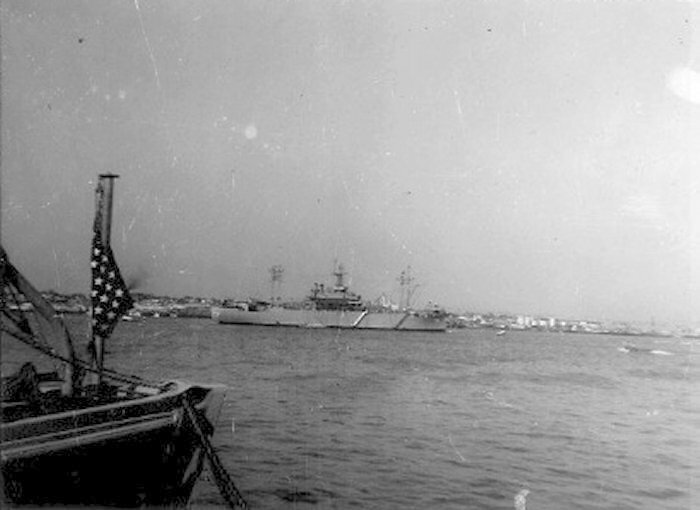 Photograph released May 6, 1956. 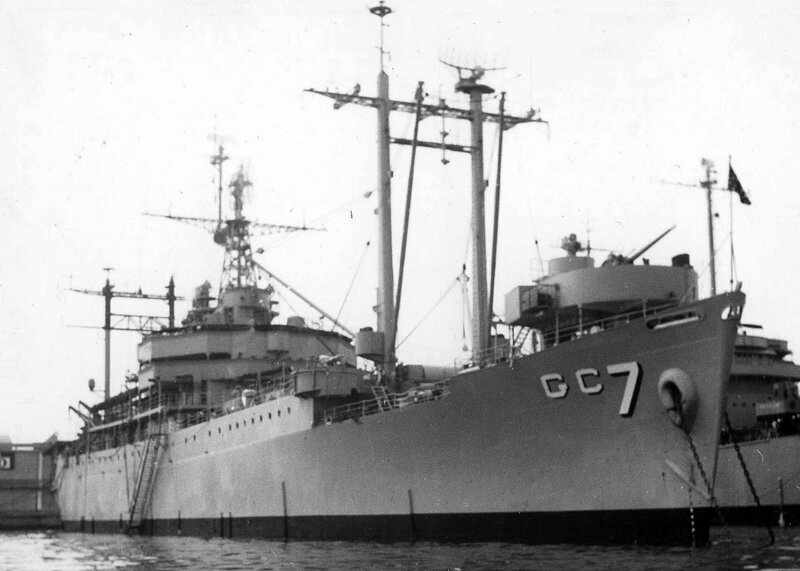 76k USS Mount McKinley (AGC-7) underway, circa 1957, location unknown. 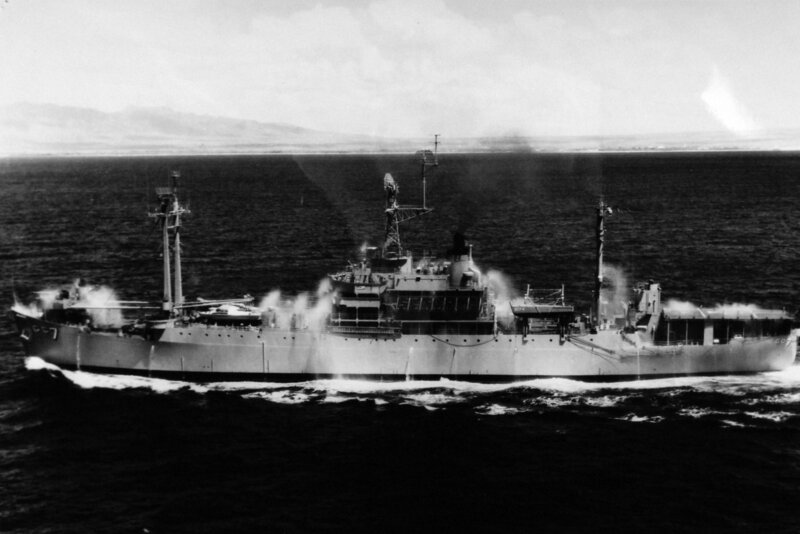 368k USS Mount McKinley (AGC-7) underway, circa 1961, location unknown. 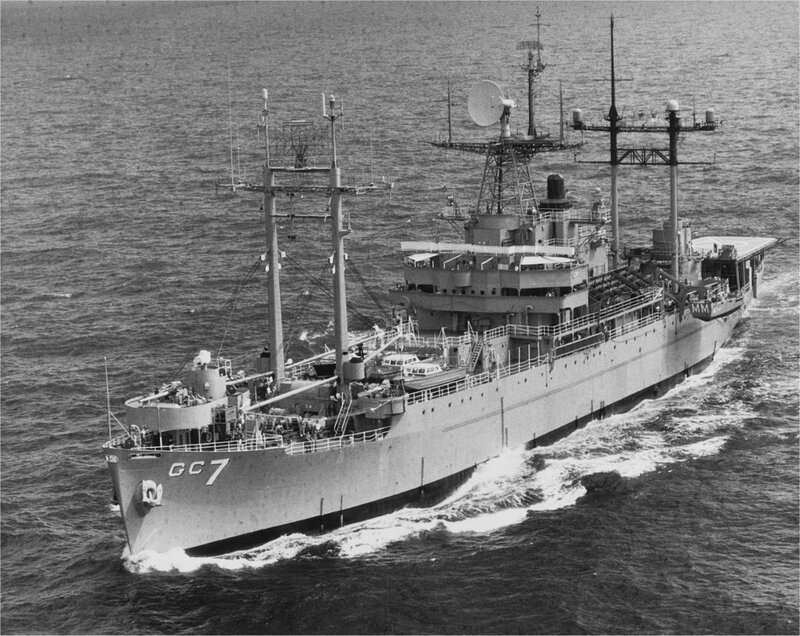 Note helipad aft. 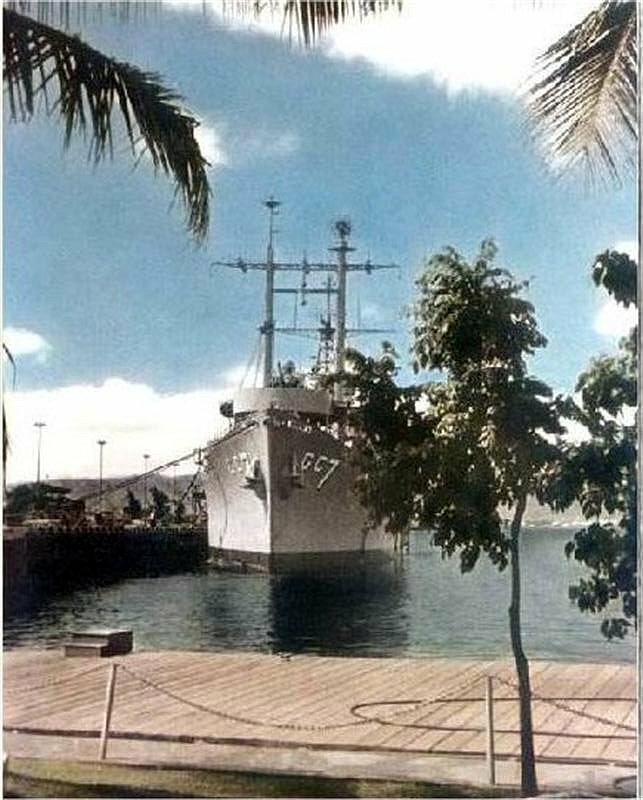 107k USS Mount McKinley (AGC-7) at anchor off Vieques Island, Puerto Rico, in 1962 during Exercise PHIBLANTEX 1-62. 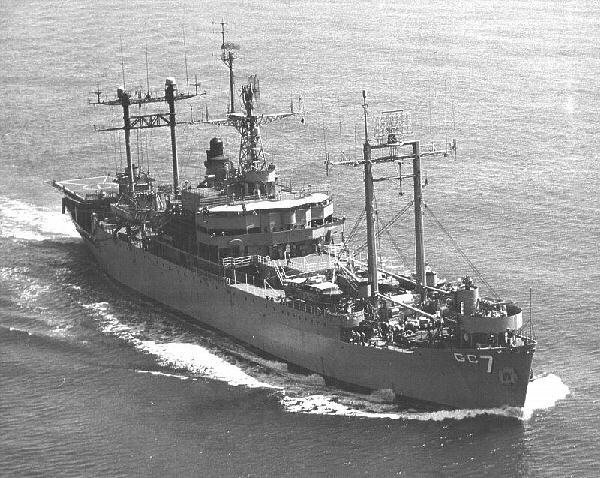 Note the plethora of antennas on her masts. 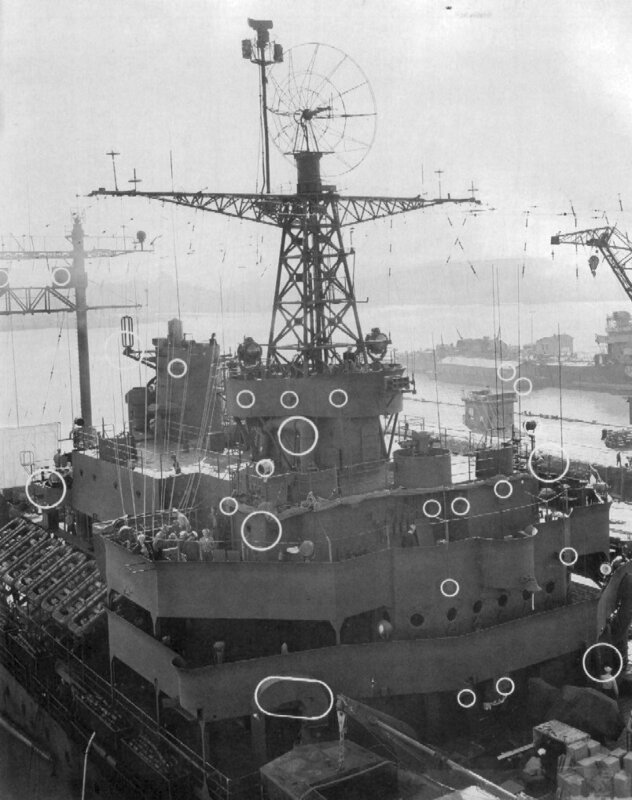 Each ship of this class developed over time a different configuration of antennas. The ship in the upper left is a MSTS Victory Class cargo ship. 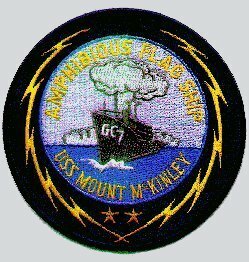 302k USS Mount McKinley (AGC-7), flagship of Rear Admiral John M. Lee, Commander, Amphibious Group ONE and Amphibious Forces, U.S. 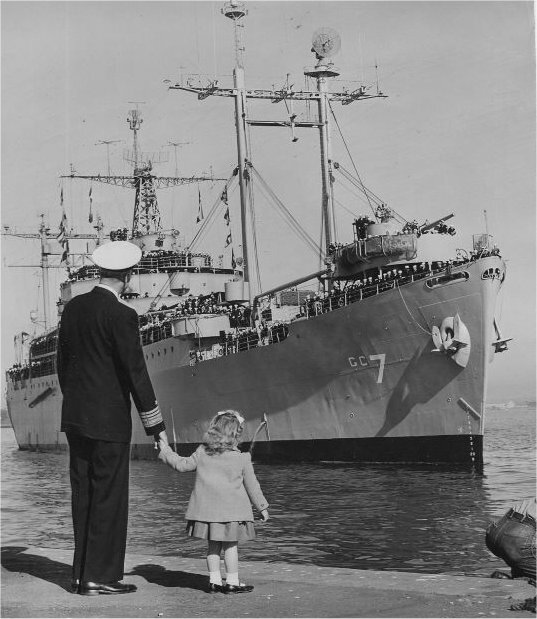 Seventh Fleet. 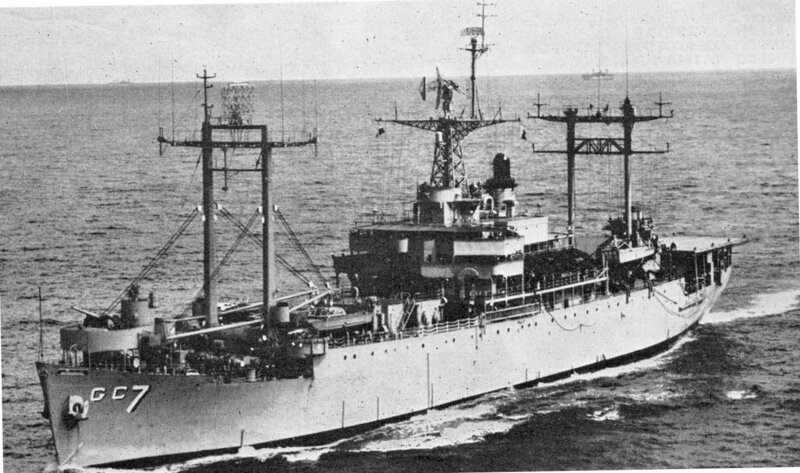 Photographed circa 1964, when the ship's Commanding Officer was Captain Louis K. Tuttle Jr. This image was received by All Hands magazine on 3 December 1964.